It’s Fall and I haven’t really posted any true fall posts, as of yet. Hopefully, this post will remedy that situation and get you prepared for Thanksgiving. 🙂 This is a beautiful plate, isn’t it? I know some of you are going chiles, again!!! Is there nothing you don’t put chiles in?? Well, to tell you the truth, this dish started out as simply a Port Wine Cranberry Chutney, nothing more, nothing less. You see, I am trying different cranberry dishes right now because it is Fall and Thanksgiving is rapidly approaching. Typically, I make a spiced cranberry jelly on Thanksgiving. The youngest son, Knothead, loves this cranberry jelly and eats it on his dinner rolls. Sadly, he will be in Maine for Thanksgiving and we will miss his company. 😦 Nonetheless, inasmuch as he won’t be here, it gives me greater liberty for Thanksgiving dinner as there is no tradition to follow. It’s kinda like a clean slate. 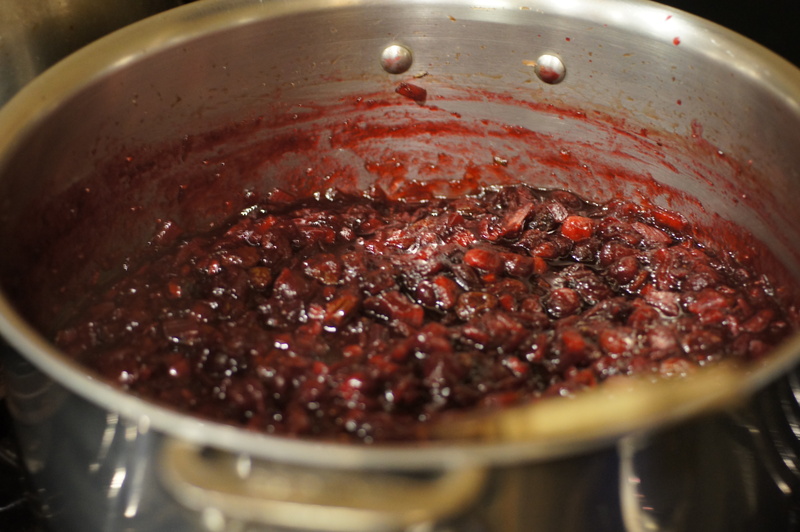 Hence, the desire to make a port wine cranberry chutney. 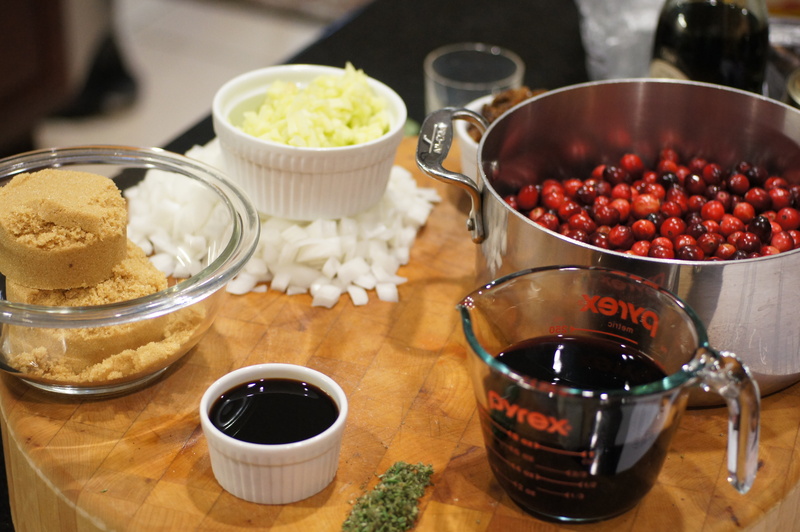 I love chutneys and I found the idea for a savory port wine cranberry chutney from Saveur magazine, only it was an ad with no recipe. So, this became somewhat of a hit or miss proposition. Since I have made a lot of chutney over the years, I felt pretty confident I could pull this off. As I was working with it and it was developing its flavor it dawned on me this would be great with the pork tenderloin I had purchased earlier. I tasted the chutney again and it hit me. The chutney needed a little smoke to it to go with the pork tenderloin. What better way to add a little smoke but to add a pickled chipotle or two. So, you see, it really was an accident that this chutney recipe wound up with chiles but it sure is good. Don’t take my word for it. Give it a try! This is fabulously delicious and the perfect Fall meal. Bring to a boil over medium heat. Reduce heat; simmer, uncovered, for 30-45 minutes or until thickened to you desired consistency, stirring occasionally. Transfer to a serving bowl. Serve warm or cover and refrigerate until chilled. Refrigerate leftovers. 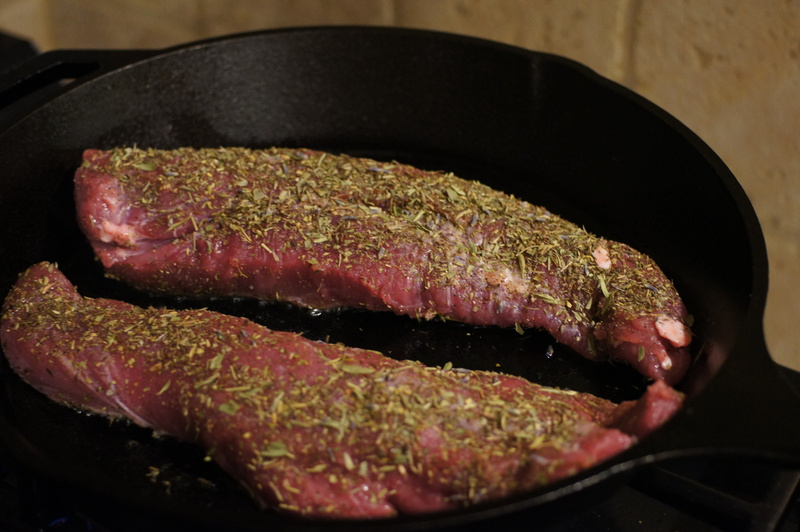 Generously sprinkle each side with herbs de provence. 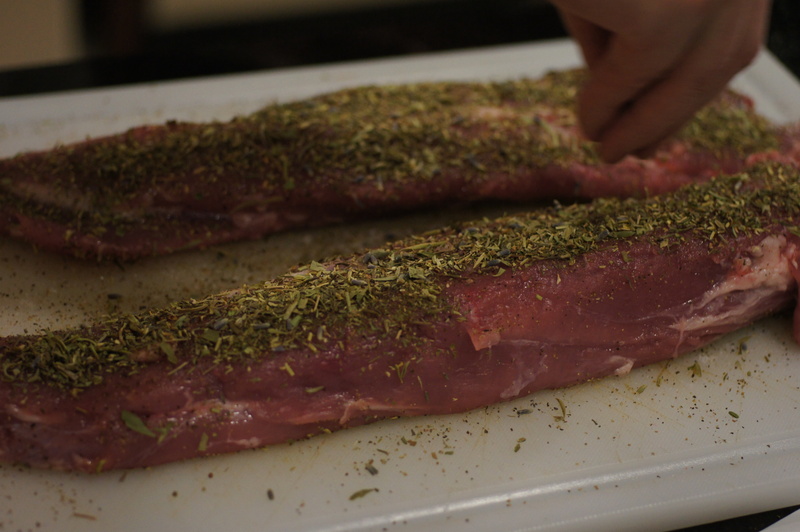 Press down to make sure the seasonings adhere to the meat. Add oil to a skillet and heat. 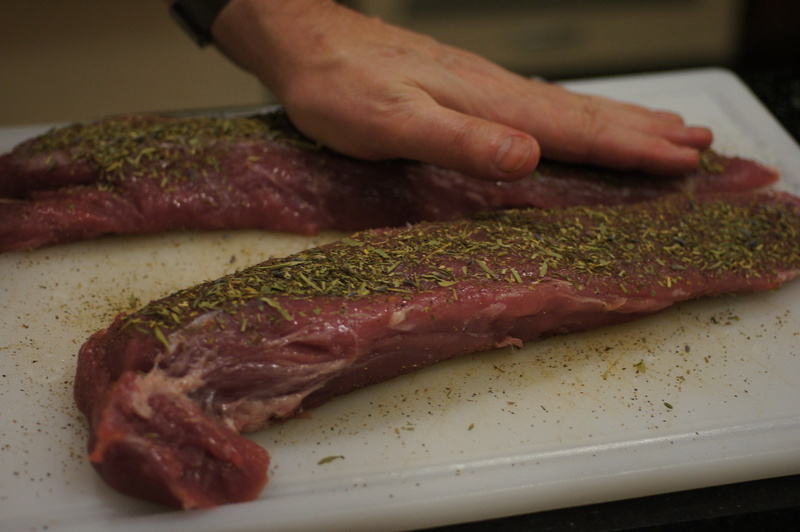 Add the pork tenderloins and heat for 3 – 4 minutes until a crust forms. 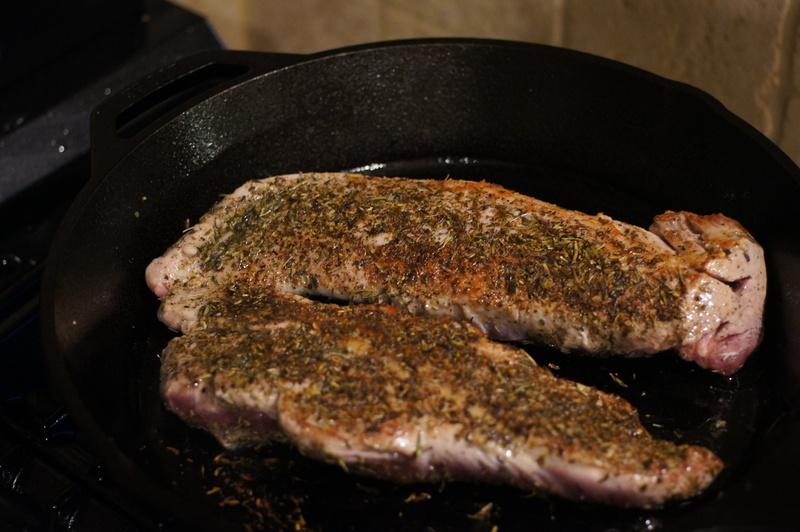 Then turn over and cook the other side another 3 – 4 minutes. Place skillet in a preheated 350 F oven and finish in the oven for 5 – 7 minutes until the internal temperature reaches 155 F. Remove from heat and let rest 5 minutes to allow the juices to cool and reabsorb into the flesh. Slice on an angle, top with chutney, serve & enjoy. Yum Richard, that is a beautiful plate of food. Very similar to a dish I had here in Austria. Thanks, Karen. I would have loved to try your meal in Austria. I have been following your travels and despite the weather, the photos have been wonderful and the meals, magical. I hope good weather starts to come your way soon and you are not headed back before Frankenstorm Sandy makes its path to Canada. The sun has come out finally and we are having a lovely time. Hope the storm turns and doesn’t head your way. I am back to envying you your ingredients. Cranberries are an outrageous luxury here. They are very difficult to get and the ones we do get are pretty dreadful. As a total aside, we suffer the same with mangos. The tenderloin looks excellent and I can only imagine how well the cranberry chutney tastes. BTW, What camera are you using? Hi, Conor. Glad you liked the recipe. Sorry to hear cranberries are a luxury because they are so commonplace here we tend to take them for granted. We get them year round but I only eat them in the fall. I guess I should be ashamed, Of course, fresh tuna is commonplace in Hawaii; so, it all depends upon where you are located, doesn’t it? While the world is getting smaller in so many ways, it is still ridiculously large in others. One of the guys in the office has one of the new Sony’s the ‘something’ 5. IT is very impressive. I added a tiny Canon to my collection. The big attraction is it’s macro function. Amazing technology in an €88 camera. He probably has the A55. It along with the A77 and A 33 are the newer DSLRs Sony is producing. They have moved away from the standard single lens reflex (SLR) system of focusing to and electronic viewfinder. As such, it is technically not a DLSR but it is considered one because it looks like one. Anyway, eventually, all camera manufacturers are going to move to electronic viewfinders because they are simply faster and allow you to actually see depth of field in the viewfinder, among other things. It’s a pretty sharp camera and, with lens, runs US$ 850 and some change. That sounds like it. I am lucky enough to use a Canon 5D Mk 11. It is an office camera that they now refer to by asking me “Do you have the food camera?” I have lots to learn. That is half the fun of it. THAT is one sweet camera! My nephew is a professional photographer for the US Pentagon and that is the camera he uses. No doubt a lot more successfully than I do. I’m sorry to hear your youngest can’t join you for Thanksgiving. But it’s great for us, for now we have a new rich and saucy Chutney recipe to try! I love the sounds of this one! Thanks, Barbara. All of the kids are now grown and scattered across the US. Only the oldest lives in DFW now and he just recently got his life in order and moved into his own place. It’s one of those bittersweet moments in life. We miss the children dearly but now I get to spend all of my time with the woman of my dreams. No distractions. No interruptions, Children are supposed to grow up, leave and get on with their own life. They have and we are happy for them even while we miss them. I could never live without the Baby Lady and I cannot tell you how wonderful it is to have the whole house to ourselves. I am a teenage boy all over again. When I found her and she married me I truly realized that I am the luckiest man in the world. How wonderful! You’ve given me something to look forward to! Wow, the fresh cranberries really ding in terms of colour and no doubt the flavour and tartness compliment those lovely tenderloins. Confession, being in the Southern Hemisphere I’ve never tried fresh cranberries, we seem to get the dried sort here. Either that or I’ll need to grow my own. Regardless, looks like a tasty dish well worth the time. Thanks, Alice. 🙂 This was a wonderful meal. We served it with baked sweet potatoes with butter and sautéed baby bok choy with garlic. I loved the fall colors of this dish. 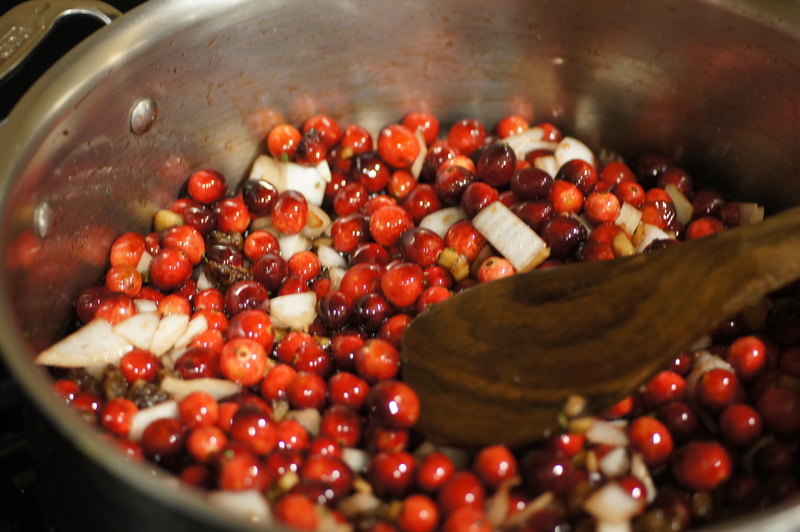 While I prefer fresh cranberries, you can also make the chutney with fresh frozen cranberries. Can you find them down under? This really does look good, Richard. Your opening photo is just about perfect! 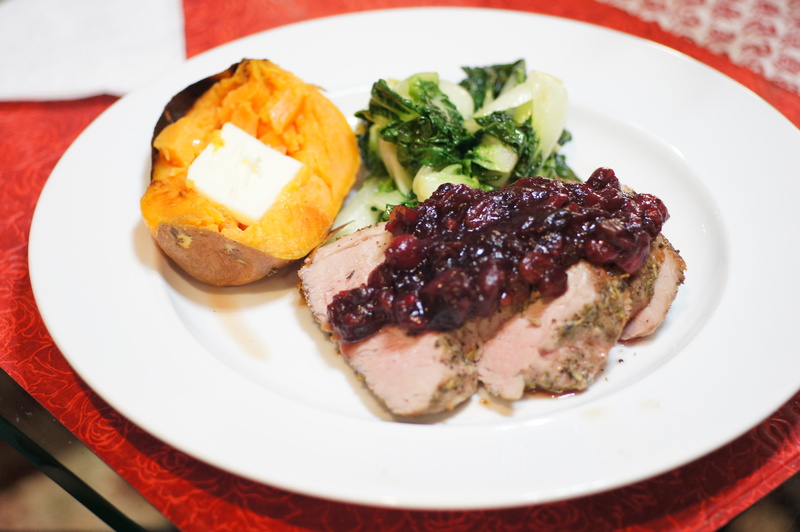 From the herb rub to the cranberry chutney, this would make a great Fall dinner. This chutney sounds marvelous! And I’ll bet it would be divine on grilled duck or turkey as well. Mmmmmmm. This chutney sounds fabulous. I love cranberries with pork. As this is Tim and my first Thanksgiving married, one of us will be without our parents for the first time this year. (We haven’t set our plans yet.) It is a very bitter-sweet part of life’s changes I guess. Sad to be changing some familiar traditions, and particularly missing family, but wonderful to be starting new traditions of our own. 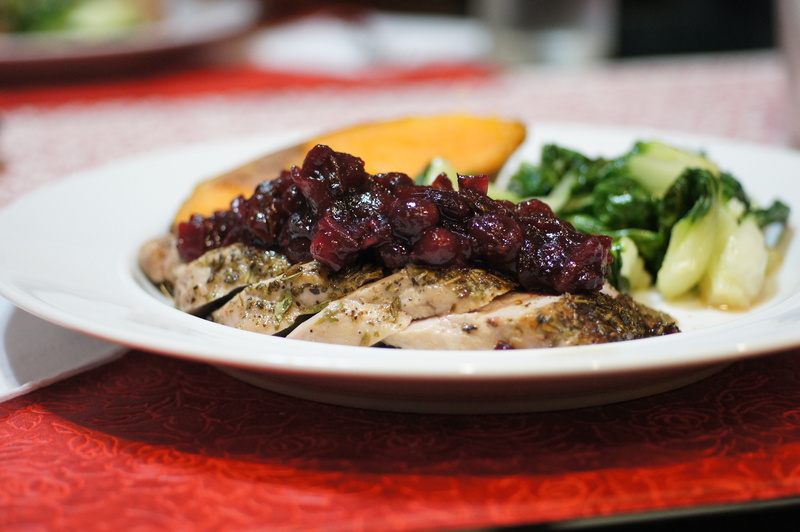 The cranberry sauce seems divine and the photo of the finished dish looks amazing! 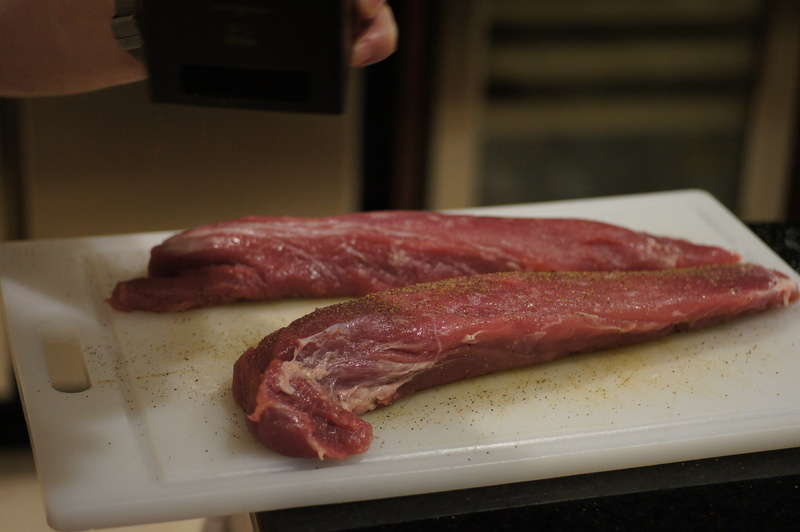 There is no way I will cook pork tenderloin to 155F/68C though, that would ruin it for me. According to the FDA it is safe to cook it to 145F/63C, and when you look at the science behind that FDA statement it is even possible to cook it to a lower temperature if it is held sufficiently long at that temperature (at 145F/63C a minimum of 4 minutes at that temperature is needed, increasing to 90 minutes at 131F/55C; the latter is of course only practical using sous-vide). I understand. Pork is actually one of the few proteins I eat medium/medium well. It has nothing to do with safety but flavor for me. People cooked pork to 155 – 160 F because of trichinosis; however, it was discovered freezing pork for 24 hours will kill trichinosis. Hence, from a food safety perspective, there is no difference between beef or pork. You can eat both of them raw, rare, medium rare, etc. Unlike beef, that I like medium rare, I prefer my pork medium/medium well.